Global exports are expected to total US$68.5tn by 2050 – four times their 2015 level – according to a new HSBC study that predicts a third wave of globalisation despite a recent fall in trade volumes. 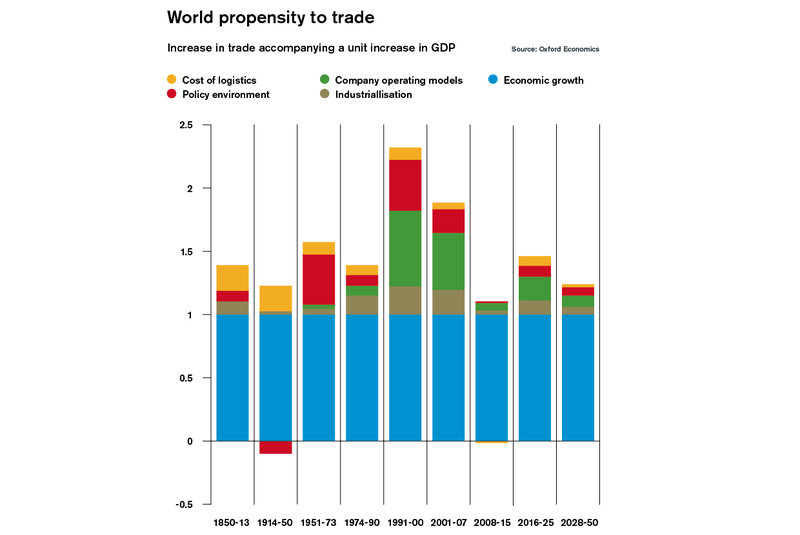 HSBC and Oxford Economics recently gathered expert opinions and analysed 150 years’ worth of data from key trading nations to understand the future of trade, determining patterns and growth factors in the Trade Winds report. The report foresees a world in which service-led industries are dominant and where businesses with explicit sustainability goals will succeed. “Making sure supply chains are sustainable will increasingly be a trend,” says Joshua Meltzer, senior fellow for global economy and development at the Brookings Institute. The demand for services will have to be reflected in traditional manufacturing companies’ product portfolios. “The trade of services is the future and the way we deﬁne world trade volumes will need to be changed as a result. If we look at smartphones, only a percentage of the work that goes into this product is hardware. The services which are provided in terms of software updates also need to be accounted for,” says Stuart Tait, global head of trade and receivables finance at HSBC. “This model of increasing export of services will continue to extend beyond traditionally outsourced activities into new areas like healthcare and education,” adds Gary Hufbauer, senior fellow at the Peterson Institute for International Economics. Digital innovation will continue to provide opportunities for businesses and individuals. New technologies create fresh products and business models that can be adapted for different markets, undermining the importance of location. Increasingly interconnected economies will bring rapid change and transmission of ideas around the world. “There will be 5 billion people online by the end of this decade, and this growth is coming from the developing world. This is a fundamental change. The internet and the free movement of data across borders underpins growth in international trade and investment […] Smart data innovation has the potential to drive tremendous efﬁciencies and optimise every cycle, which ultimately will drive overall economic growth,” says Meltzer. The supply chain will need to innovate to respond to increasing expectation and demand for greater sustainability, especially as some markets become stricter in setting sustainability criteria as part of their multilateral efforts to counter global warming. Reverse innovation is a growing phenomenon in which companies initially develop products and services for emerging markets rather than the developed world. Products can then be customised as they are sold into different markets, representing a shift from mass production to mass customisation. Customisation will benefit from analysing growing volumes of customer data and using sophisticated marketing techniques to understand and influence customer requirements. An increasing ability to use data to track the world today, and forecast the future, will enable companies to build intelligent systems that track information and consumer demand. The development of 3D printing will contribute to innovation in the supply chain, with many local factories producing goods on demand through the technology (a phenomenon known as additive manufacturing). Factories of the future “will be small and ﬂexible rather than large and rigid, and located close to the end customer. Forensic data analysis tools will be used to identify patterns in big data, and best practices and improvements will be instantly shared across the factory network via the cloud,” says Graeme Philp, CEO of Gambica (the UK trade association for the automation, instrumentation and control and laboratory technology industries). Digital disruption and tightly connected global networks provide an opportunity for small and mid-sized companies (SMEs) to level the competitive playing ﬁeld against larger ﬁrms. New technologies such as 3D printing will enable smaller players to deliver products anywhere in the world. As one example of the increased success of SMEs, a 2013 study by online commerce platform eBay found that 95% of SMEs on the eBay network engage in exporting, reaching between 30 and 40 international markets. According to the report, 60%-80% of the new businesses analysed ‘survive’ their ﬁrst year, while the respective ﬁgure for traditional exporters is around 30%-50%. By 2050, trade will be boosted by improvements in logistics. The cost of shipping will fall, driven by a combination of larger vessels and the expansion of shipping lanes. New airports, with increased energy efficiency and further streamlining of border control processes, will speed up trade and reduce air freight costs too. In addition, continued advances in transport technology and infrastructure will increase capacity, opening up new trade routes. The pace of trade liberalisation will continue with the extension of free trade and the continuing harmonisation of standards and regulations to reduce barriers to trade, fostering the rise of “mega-regionals”. A more stable political and currency environment is anticipated, making trading easier for companies around the world. “By 2020 we will have the new rules and terms of organisation of trade and investment that should allow countries to go back to the multilateral trading system. 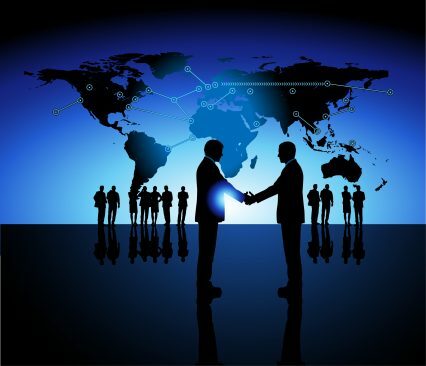 We will see more and more plurilateral agreements within the multilateral system – it will become a club of clubs,” says Ricardo Melendez-Ortiz, co-founder, chief executives at the International Centre for Trade and Sustainable Development (ICTSD). According to HSBC’s report, China, the US and Germany will keep leading the world’s trading patterns – but with the US and Germany on a downward trajectory, with South Korea looming behind them, on the rise. Economic crises, recession or even periods of low growth – including in China and other developing economies. Political reaction against the perceived negative impacts of globalisation (for example growing inequality).